PASADENA, Calif. – The Rose Bowl will be final collegiate start for Washington’s Jake Browning. Whether or not it will be for Ohio State’s Dwayne Haskins remains a mystery. Haskins’ future has been as much a topic of conversation as Urban Meyer’s final game as the Buckeyes’ coach. The redshirt sophomore finished third in Heisman Trophy voting after leading the nation with 4,580 passing yards and 47 touchdowns while directing the Buckeyes (12-1) to a Big Ten title. After Justin Herbert announced he would return to Oregon for his senior season, Haskins has emerged as the top quarterback prospect should he decide to declare for April’s NFL Draft. He has said throughout the week though that he is taking his time since the deadline isn’t until Jan. 15. While many are projecting Haskins as a possible first-round pick, Browning’s name doesn’t generate as much fervor. The senior has directed the Huskies to a Pac-12 Conference-record 39 wins, but he hasn’t duplicated a successful sophomore season, when he threw for 43 touchdowns, finished sixth in Heisman balloting and led Washington to the College Football Playoff semifinals. 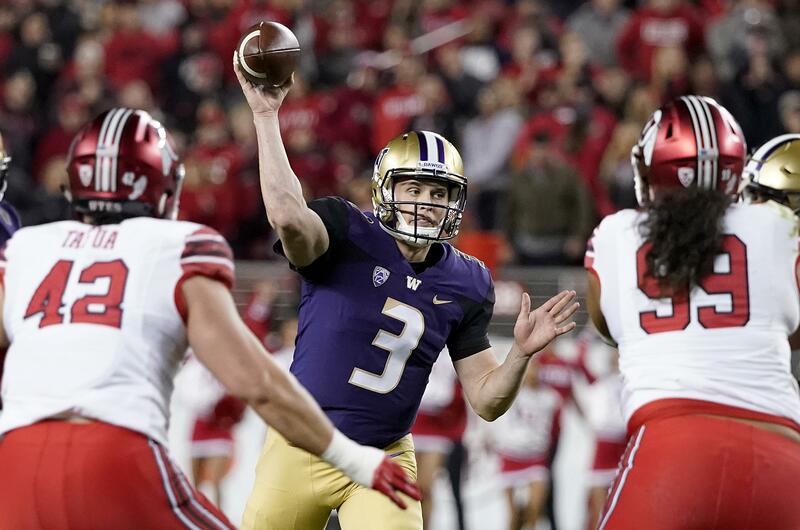 Browning has thrown 35 touchdowns the past two seasons as the Pac-12 champion Huskies (10-3) showed more balance on offense but there were also times when he struggled with decision-making and turnovers. “I don’t think I’ve been someone that was super high ranked on anything, even coming into college,” Browning said. “I’m kind of used to that. I’ve been an underdog for a long time, and it has worked out for me. While Haskins has thrown for at least 230 yards in all 13 games this season, Browning – who threw for 2,879 yards and 16 touchdowns – has done that only five times. Haskins had four games where he threw five or more touchdowns while the most Browning had this season was three, which he did in two games. What both players do have is the confidence of their head coach. Meyer said he would put Haskins’ leadership up there with two of his former quarterbacks J.T. Barrett and Tim Tebow. Washington’s Chris Peterson said Browning’s wins speak loudest. “He hasn’t flinched. He’s won a bunch of games. His teammates really love him. We love him. And I don’t know what there is else to say about him,” Peterson said. Both quarterbacks could face their toughest tests of the season. Washington has one of the more experienced secondaries in the nation with four starters that are either a junior or senior. Huskies defensive coordinator Jimmy Lake compared Haskins to Ben Roethlisberger due to his size (6-foot-3, 218 pounds) and ability to make all the throws. Haskins compared the Huskies’ scheme to Michigan State in terms of their physicality but also Northwestern because of the secondary playing mostly zone coverages. Browning has experience facing Big Ten defenses as Washington faced Rutgers and Penn State last season. He said the biggest key is having more patience since the Huskies don’t see as many teams that are as aggressive defensively as the Buckeyes. Published: Dec. 30, 2018, 5:45 p.m.